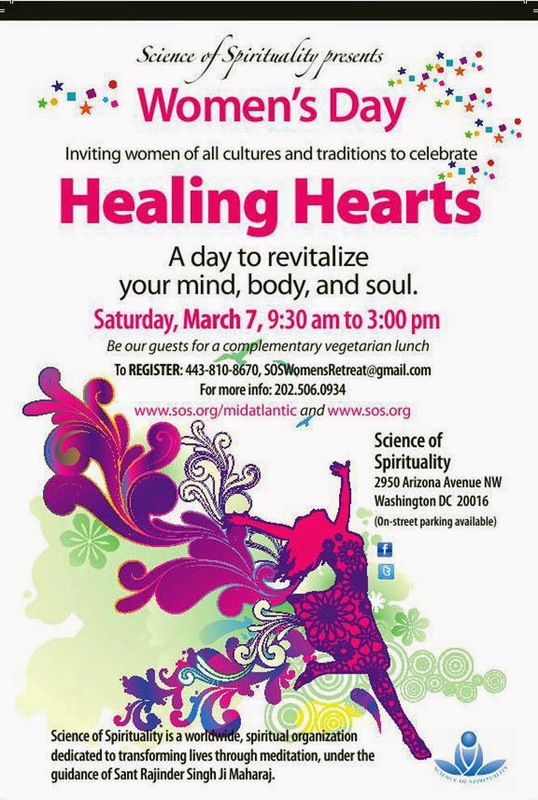 Come out and revitalize your mind, body and soul in honor of International Women's Day at this free daytime retreat at the Science of Spirituality's Center located in a residential neighborhood in DC, near Arizona & Cathedral Ave, NW. Vegetarian lunch will be provided to all who attend. SOS DC also offers free meditation workshops at area libraries and ongoing Sunday morning meditations as well as free four week introduction to Jyoti Meditation on Monday nights at their DC Center. Metro: Not that close to a metro but accessible by bus. See metro trip-planner for best bus acces looks like the M4 and D6 buses get you pretty close. For those with cars, street parking is available.